Get Ready for Waterproof Makeup Season: Homemade Eye Makeup Remover Recipe! Home » Beauty & Style » Get Ready for Waterproof Makeup Season: Homemade Eye Makeup Remover Recipe! This simple and homemade eye makeup remover recipe is gentle and cost effective for removing all makeup…especially the stubborn, waterproof varieties! Don’t let appearances deceive you. This truck driving, beer drinking, chicken farming tomboy loves her some makeup! Or, maybe that didn’t surprise you at all because aside from the truck most of the other stuff doesn’t make it on the blog too often. What can I say? I am my mother’s daughter and never feel quite like myself until I have my face on. Especially eye makeup. That’s not to say friends have never seen me without makeup. With two babies that came before their due dates, my aspirations of looking amazing in my birth photos kind of flew out the window. I’ve been obsessed with makeup for as long as I can remember and started wearing it daily when I was 11. It started with clear mascara and lipgloss and quickly blossomed into a full face. While these days I can’t manage the time it takes to properly put on a full face of makeup between drop offs and pickups and playdates and work and shopping and general life, I still love putting on makeup. Honestly, it doesn’t even matter if no one else sees. Yeah it makes me feel more confident around other people, but sometimes I like to just relax and put on makeup…just because. The major downside with makeup for me, is having to remove it. If you don’t remove your eye makeup, you’ll have raccoon eyes in the morning and that’s just not an attractive look for anyone. But then again, I loathe spending money on pricey eye makeup removers. Especially the eye makeup remover wipes since they’re generally more expensive but make life so much easier. So in the spirit of making my own effective homemade sugar scrubs, I created this homemade eye makeup remover recipe. 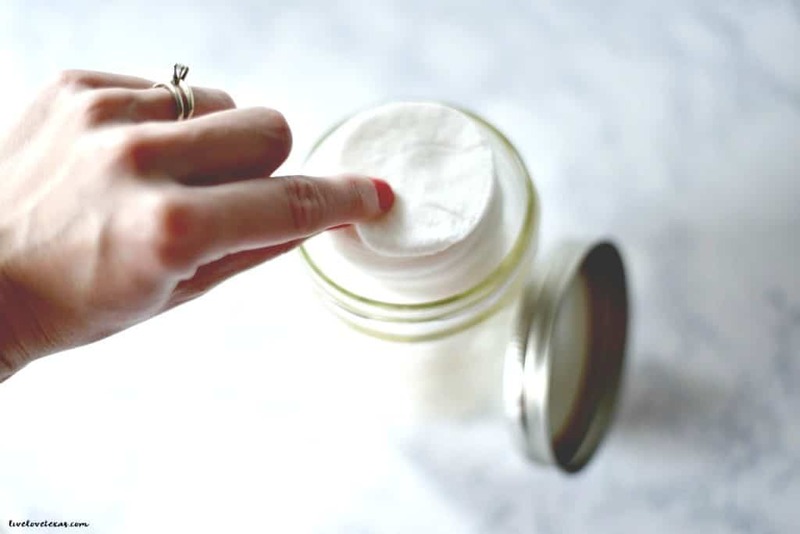 This homemade eye makeup remover recipe is super easy with only four ingredients, perfect for sensitive skin as its very gentle, and so cheap. Your price may vary based on the products you use, but I went with my local store brand and it’s very effective for a fraction of the cost! Mix together all ingredients in canning jar. Place cotton rounds in mix pushing down and adding more as they absorb. 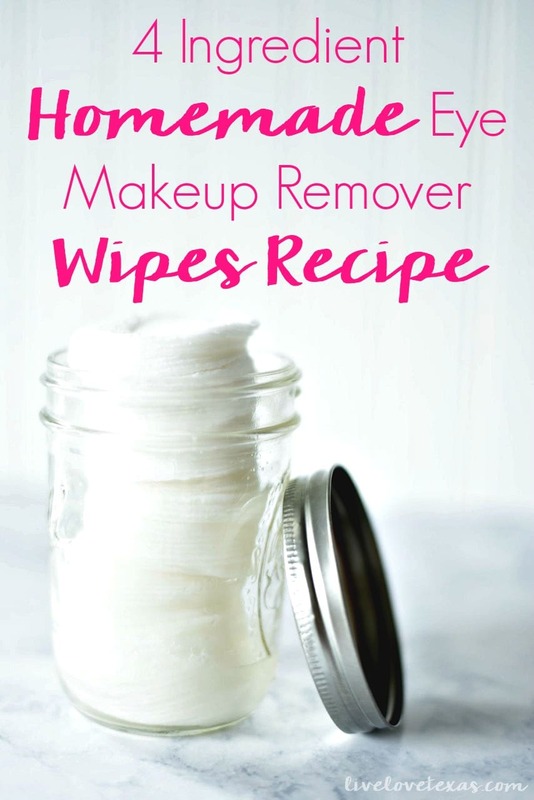 Easily wipe away all of that waterproof makeup! Make sure you follow me on Pinterest for more homemade beauty recipes, routines, and tricks! « Spark Curiosity in STEM with the Curiosity Cube Tour!